French Riviera City Of Cannes Bans 'Burkini' Swimsuit Designed For Muslim Women : The Two-Way Cannes, a major summer destination, has banned a women's swimsuit designed around Islamic ideas of modesty. The city's mayor calls the burkini "the symbol of Islamist extremism." The French Riviera city of Cannes has banned a full-body swimsuit called a burkini designed with Muslim women in mind. 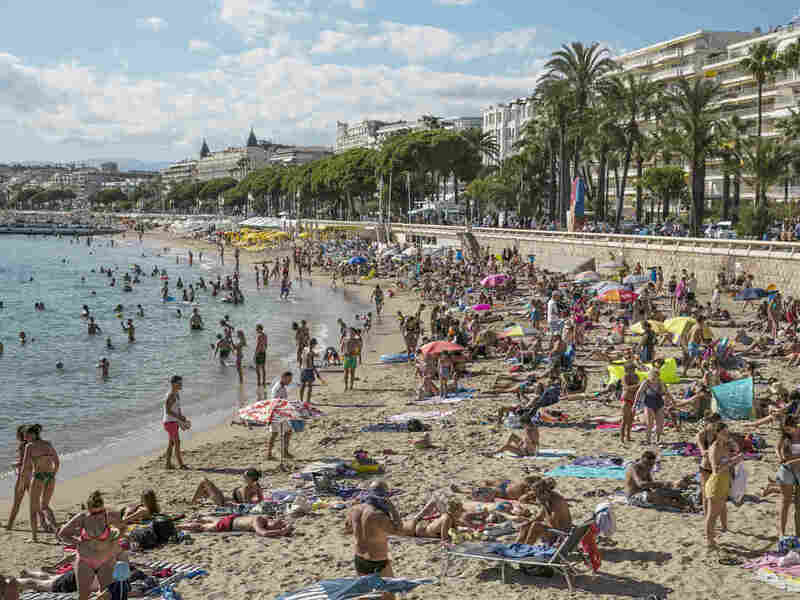 The French Riviera city of Cannes has banned beachgoers from wearing a swimsuit designed for Muslim women, called a burkini, citing the recent Islamist violence. 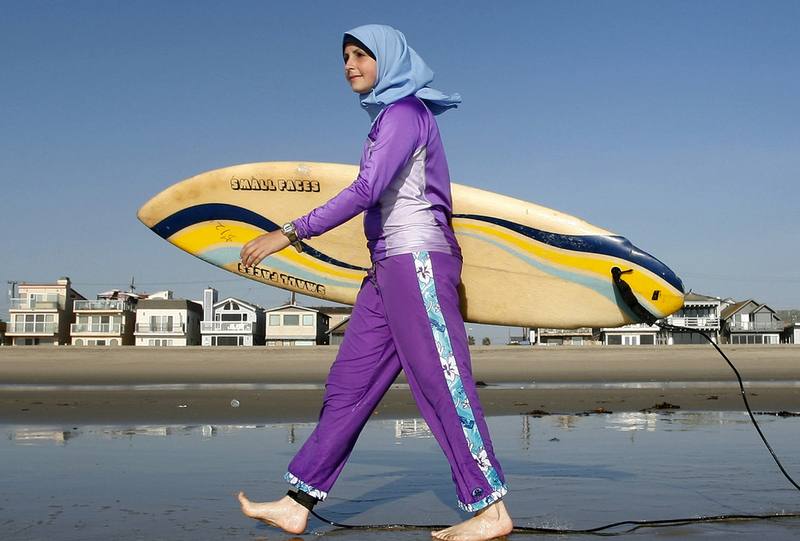 Going into effect late last month, a city ordinance bans the burkini as well as any swimwear that "ostentatiously displays religious affiliation, when France ... [is] the target of terrorist attacks." Sama Wareh wears an example of swimwear designed for Muslim women. City ordinances in Cannes effectively forbade the burkini as well as swimwear that "ostentatiously displays religious affiliation, when France and places of worship are currently the target of terrorist attacks." The law was introduced by Cannes Mayor David Lisnard, whom The Associated Press quotes as calling the burkini "the symbol of Islamist extremism." Anyone caught violating the law — which lasts through August — will be asked to change or leave the beach, and could be fined 38 euros (or approximately $42) the BBC reports. There's been no word on whether officials plan to extend the ban through September. The burkini ban is far from the first such ban in France. In 2011, the country became the first European nation to ban the face-obscuring burqa. And earlier this week, a water park in the city of Marseille canceled a burkini-only event scheduled for September after complaints, according to the BBC. "Mr Lisnard confirmed to local media that other religious symbols such as the kippah (Jewish skullcap) and the cross would still be permitted, and the ban would not apply to the veil that some Muslim women wear over their hair. "He said: 'I simply forbid a uniform that is the symbol of Islamic extremism.' "
France has been on high alert in the aftermath of recent terrorism, including a deadly truck attack in Nice, which killed 84 people some 20 miles from Cannes. "French secularism was established by a 1905 law that strictly separated the church and state. At the time, the law aimed to keep a powerful Catholic church from dictating policy. While secularism is meant to ensure the state's neutrality with regard to religion and ensure that all religions can practice freely, many feel it is now being exhorted to discourage religion — especially Islam." Eleanor also noted the country is struggling to "balance tolerance, secularism and personal freedom" following repeated attacks.